Do you have dreams of bringing home a new best friend, but you think your place is just too small? Do you wish you could have a Saint Bernard, but know that he might not fit in your 500 square foot Loft? Is your son begging you for a pet boa constrictor, but you’re just not sure you can sleep in your own room, knowing that snake is in the next room? If you’ve been wishing for a pet to call your own, but afraid your Loft is too small, we’re here to put your fears to rest. These pets are perfect for those of you who are big on love but short on square footage. If you long to revisit your childhood days at the shore, why not get yourself a hermit crab? Sold as living reminders of your vacation from many a seaside souvenir shop, hermit crabs actually make great pets, as they’re quite social. They do require just the right environment and the appropriate diet, but are otherwise low maintenance. Treat them right, and they could become a lifelong companion, as evidenced by this 40-year-old hermit crab known as Jonathan Livingston Crab. Longing for something cute and furry? How about a fancy rodent like a hamster, guinea pig or rat? Before you curl your lips in revulsion at the thought of having a pet rat, they are highly intelligent and can be taught tricks, which could be really fun to demonstrate at your next party. If you live alone and tend to get a little lonely, guinea pigs are known to be talkative, with a large vocabulary of whines, squeaks and clicks. They make great conservation partners. If you’re looking to increase your followers on Instagram, then a photogenic pygmy hedgehog is just the ticket. 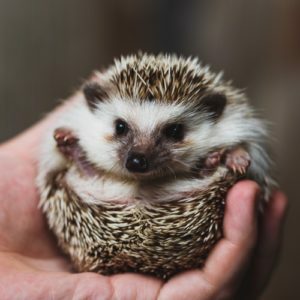 Purchase a hedgehog from a reputable breeder and handle them regularly while they’re still young so they get used to it. They also don’t seem to mind being alone, which is a bonus. Rabbits can make a great alternative to a cat or dog, if you want something fluffy to love. Rabbits are friendly and social and can be great companions to humans, with lifespans of up to 10 years. Rabbits do require far more care than some of the pets mentioned above, and aren’t a great match for families with young children. It’s also important to remember the time commitment – far too many rabbits end up in shelters after being given as gifts during Easter. Small birds, such as parakeets, finches and cockatiels can make excellent, if noisy, pets with minimal needs outside of a cage, toys and human interaction. Large birds, like parrots and macaws, are undeniably fabulous, but require expert care. If you decide to adopt a feathered friend, it’s best to get a small one unless you are an experienced bird keeper. So there you have it! If you’d like to welcome a pet into your life, but traditional pets like dogs or cats won’t work in your space, try one of the suggestions above. You never know what kind of creature may end up stealing your heart and working perfectly in your small Loft.